NEW YORK — The Red Wings will miss the playoffs for the third consecutive year, but they’re trying to develop a strong foundation for next season. 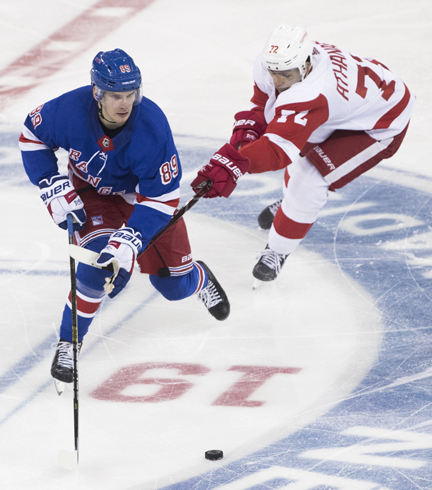 Detroit got two goals from Andreas Athanasiou on Tuesday night for its second straight victory, 3-2 over the New York Rangers, who are on the brink of elimination from the playoffs. Frans Nielsen also scored and Taro Hirose recorded an assist during his NHL debut for Detroit. Jimmy Howard stopped 41 shots and improved to 10-3-3 in 16 career appearances against the Rangers. Ryan Strome and Brendan Smith scored for the Rangers, who dropped their fifth straight game. Henrik Lundqvist made 27 saves. Athanasiou scored at 4:30 of the second period to give Detroit a 2-0 advantage. Jacob de la Rose delivered a saucer pass to set up the strike. Michael Rasumussen also assisted on Athanasiou’s 27th of the season. Nielsen opened the scoring at 17:16 of the first period when he held off defenseman John Gilmour and sneaked a wrister past Lundqvist. Hirose and Brian Lashoff assisted on the play. The Red Wings signed Hirose as a college free agent out of Michigan State, where he led the NCAA with 50 points (15 goals, 35 assists) as a junior, and became the Spartans’ highest-scoring player since 2002-03. Hirose is a finalist for the Big Ten Player of the Year Award, to be announced next week, as well as the Hobey Baker Award for the top player in college hockey.